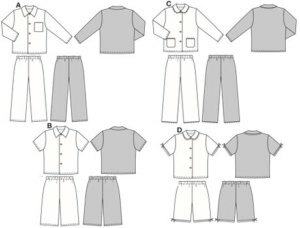 Pyjamas in normal width, with elastic waist casing on trousers/pants and button fastening/closure on jacket. Views AC with long trousers/pants and long sleeves. Views BD with short trousers/pants and short sleeves. With pointed collar for boys or with Peter Pan collar, prettily decorated with lace and ribbons for girls.